Undoubtedly the most beautiful of all postwar Hudsons were the three customized sedans built by Derham between 1948 and 1952. 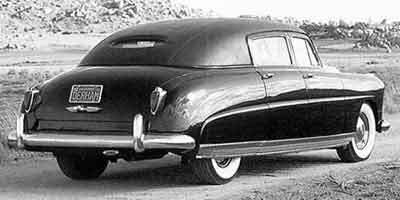 The first was built for the widow of Hudson’s founder - Roy Chapin, Sr. Derham transformed a 1948 Commodore Eight into a formal sedan with the addition of a curved-glass divider window and a padded-leather roof with blind quarters and a custom-built oval rear window. The large rear window of the Hudson’s were discarded and replaced by a built-up a wood framework into which Derham set a much smaller rear window more in keeping with formal look of the vehicle. Metal panels where hand fabricated and installed over the wooden rear window insert allowing a smooth transition to which the thickly padded Derham top was attached. A second was built for Hudson’s president A.E. Barit using a 1951 Hornet. It differed from the Chapin car in that it had a flat divider window and was updated in 1952 and 1953 to look like a brand-new Hudson. Barit’s Hornet now resides in the vast collection of the Henry Ford Museum. The third copy was built for a friend and neighbor of the Chapin family named Richard Webber. His car was built using a Brewster Green 1951 Commodore Eight and was built without a divider window.